I’m often asked why we have chosen to live in the middle of nowhere on a ranch where there is nothing fun to do. I just think, “Nothing to do? There is always something to do!” They must have never played hide and seek in the tall grass, swam in a creek or taken a picnic up the mountain on the horses. When asked those questions, I almost feel bad for the people who have never had the chance to live this way. Most of these people live a life of 9-5 jobs and rely on an event or attraction for entertainment on the weekends. And sure they have grocery stores close by and elaborate shopping malls but they don’t have crap on their boots and real wear in their jeans. They have to buy boots that look worn and jeans with holes in them. I get the experience to make mine like that. Being a rancher’s wife isn’t always easy, we don’t live a 9-5 life with the option of taking a vacation any time of year that we please but we have so much more! We’re our husband’s best hand, we might be the only hand he has but at least we’re the best! We get to go on drives down dirt roads like every country song dreams of doing and we’re really doing it with the people we love most. People have postcards of families riding horseback or kids playing in a stock tank and that’s our reality! Some of our family’s best memories are made working together. Whether is putting cows back in that have busted down what seems like every fence from here to Timbuktu or helping a cow have her first calf and getting to watch life unfold. In the moment we might have been cussing or freezing and wishing for a chair on the beach but we know that what we are doing has purpose. We are caregivers and what we do today will give benefit for tomorrow. To those looking in, they might not see that from the time our kids are born they’re out with us working each day. We are teaching them the value of hard work through their whole lives. Not only do they learn how to work hard but to find enjoyment in each day. 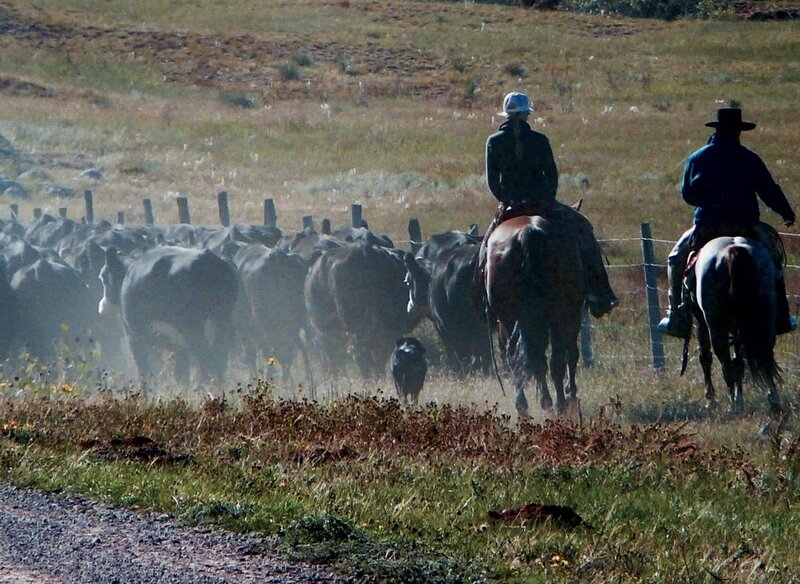 Some families only ever know the parents to go to work and come home, ranch kids get to go to work with their parents and learn what life is about. Ranchers aren’t just building a legacy for their families; they are building it with their family. This legacy we’re building isn’t all material things and money to be passed down but one of integrity, hard work and laughter. Some people look at our lifestyle and think how great it would be to life so stress free. Sure we might not have the stresses that come with the hustle of the city but we know the stress of praying for rain in a dry summer or having calves born in 30 below temperatures or praying the first ride on your new horse goes smooth. It’s all a trade off and one that has been 100% worth making! Growing up when we would miss school and our teachers would ask why we weren’t there, Dad would just say, “We can’t let school get in the way of a good education.” Ranch kids get an education in common sense and hard work that can’t be taught any other way than through experience. I’ll be the first to tell my kids that when their dad asks if they want to come watch him start a colt, he really needs someone to help on the ground. Or that going for a ride means you’ll be on gate duty and a quick fix will probably take all day. The blessing in it all is the conversation and time spent together. We will teach them that ranching isn’t a job title but a lifestyle; we don’t take sick days or vacations because animals need to eat every day too. We take pride in what we do and never do anything that would bring shame to our last name. We wake up, take a bath, put on clean clothes and are ready for the day everyday with a smile on our face.